» Movie Review – DOUBLE DEAL (1950). Movie Review – DOUBLE DEAL (1950). DOUBLE DEAL. RKO Radio Pictures, 1950. 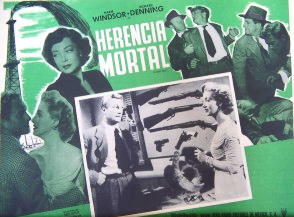 Marie Windsor, Richard Denning, Fay Baker, Taylor Holmes, James Griffith, Carleton Young. Director: Abby Berlin. How many black-and-white crime movies from the 1940s and early 50s have you seen beginning with the leading man swinging off a bus in a strange town, looking for a job and not trouble, but ending up finding both? 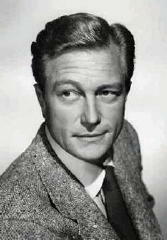 I’ve seen a few, although I can’t name them all, and not only that, but I think Richard Denning was in one of them. Besides this one, that is. I’m glad I didn’t, though, since this one’s a keeper. Not only that, but it has Marie Windsor in it. She plays Terry Mills in this one, a good friend of Reno Sebastian (Carleton Young), the man who owns the well that so far has hit nothing but sand. It seems that his sister Lilly (Fay Baker, who makes a terrific villainess) hates him, and she’ll stop at nothing to keep Reno from succeeding. I was once asked, a couple of years ago, to continue with the thought I began the last paragraph with, before I got distracted, which noir movie actress was my favorite. You guessed the answer, and congratulations! You didn’t need two tries. This rather obscure crime film, not quite a noir, pretty much has me stumped. The only photos I can provide you of the movie itself come courtesy of a Spanish language poster from Mexico. The one of Marie Windsor below comes from Narrow Margin, and I think the one of Denning comes from the (much later) days when he was playing Michael Shayne on TV. I’ve already told you about the basic story line. There are quite a few twists and turns in the plot that come after this, though, and these are what keep the movie watchable, even if you’re not as fond of Marie Windsor as an actress as I am. I’ve also already mentioned my opinion that this movie is not a noir film, even though it is a crime movie filmed in 1950 and in black-and-white. The presence and over-the-top antics of a drunken former lawyer named “Corpus” Mills (Taylor Holmes) takes care of that very nicely, thank you. Of course, he does come in handy when Terry is accused of murder, making sure that’s she free (as it happens) to act as bait to catch the real killer. But there are some definite noirish aspects about this film, no doubt about it — if not so much the overall mood and the happy ending — then in the lighting and the definite sense of danger that Terry’s in after her release from the local sheriff’s custody, as mentioned above. After leaving RCA Records in the early 80’s, one of the jobs I had in the video biz was participating in the effort to set up RKO Home Video. Since the company had licensed out a lot of the bigger titles, I had to scrounge through the archives to come up with films we could release. I had a ball going through all the books and catalogs I could find on the studio. I also spent time at an old warehouse where all of the surviving still photos and lobby cards were stored, and talking to a wonderful gentleman there named Vernon Harbin, who had been with the company for years. I was able to repackage and release most of the Astaire-Rogers films, as well as classics like “Citizen Kane”, “King Kong” and “The Thing”, but my favorites were the lesser known B films. Due to their short running times I usually put them into double features at a low price. “The Falcon”, “The Saint”, and other crime dramas were included, along with the Tim Holt westerns and comedies featuring the likes of Lucille Ball. Then I had to go out and try to sell those titles to video distributors who only wanted the recent blockbusters from the major studios. We did not succeed, and RKO Home Video ending up folding, but it was fun while it lasted. A desultory programmer made by Bel-Air Productions with the proviso that RKO would buy the completed picture, “Double Deal” told of two-fisted petroleum engineer Richard Denning, who accepts a rush job to bring in an oil well owned by driller Carleton Young. After the driller is killed, Denning decides to stay on and help Marie Windsor, who inherits Young’s oil lease, despite opposition from Young’s sister (Fay Baker). James Griffith, Tom Browne Henry and Paul E. Burns were also cast. James T. Vaughn produced, employing Don McGuire to write the original story, Lee Berman and Charles S. Belden to turn it into a screenplay and Abby Berlin to add the tepid direction. 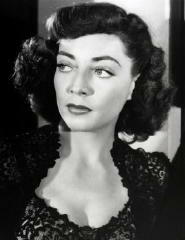 Marie Windsor was always a favorite of mine, in minor classics like “The Narrow Margin”, Stanley Kubrick’s “The Killing” and Republic’s Trucolor western “Hellfire”. It sounds like you had a great job, at least for a while. How much did you have to pay them to be able to work somewhere like that, where you had access to all that great old stuff? My copy of “Double Deal” seems to have come via AMC, back when they showed the kind of classics I like to watch — and without commercials! By the way, I edited that review so as to not reveal most of the ending. I also get the feeling that I liked the film more than Mr. Jewell did. Both “Double Deal” and “The Hatbox Mystery” are completely new to me. Never heard of either. Thanks! “Fallen Angel” starts with Dana Andrews riding into a strange town on a bus. It’s terrific. With all due respect to Dana Andrews and Alice Faye, the real stars of “Fallen Angel” are Linda Darnell and Pop’s diner. Pop himself, of course, was played by Percy Kilbride, in a role he was, as they say, meant to play. As for Stella, I think every male character in the picture fell in love with her at first sight, and with good reason. You’re right, Mike. What a terrific film. You don’t easily forget movies as good as that one.